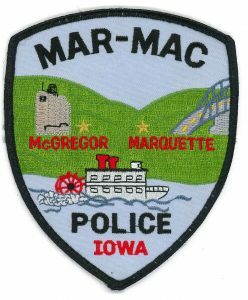 Mar-Mac Police District – Serving the communities of Marquette and McGregor, Iowa. Welcome to the new Mar-Mac Police District’s website! The Mar-Mac Police District’s website was created as an online source to enhance the district’s transparency to the citizens and visitors of the communities of Marquette and McGregor, Iowa. Over the next several months, this website will experience many changes. All of which should provide a clear insight into the district’s activity. Please bookmark this page and return frequently to get updated press releases, seasonal crime prevention tips, and to see what is happening in and around the Marquette and McGregor area. You can also “like” us on Facebook, or “follow us” on Twitter. VALUES – Mar-Mac Police Officers are committed to serving the communities of Marquette and McGregor with dignity, honesty, respect, sincerity, integrity, and to value the public and our co-workers as individuals. GOAL – The goal of the Police District is to set the standard as a leader in law enforcement by striving to maintain a safe environment and by providing the highest level of professional services to the citizens and visitors of the Marquette and McGregor communities. MISSION – The mission of the Mar-Mac Police District is to provide a progressive public safety agency to fulfill the diverse needs of citizens and visitors through the expertise of our professional staff and the utilization of all available resources.